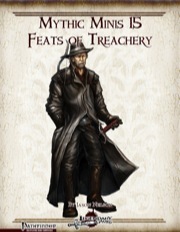 This time, we're all about feats of treachery, so let's check this out! All right, we begin this collection with "Betrayers" mythic version, which makes the attacks against foes you befriended is further increased - very much a standard improved version with slight mythic bonuses. Okay, but bland. Deceptive Exchange's mythic version is more interesting, allowing for disarm/steal to accompany the feint and even replacing items in foe's hands. "Disengaging Feint" as a mythic feat can be used as a swift action or as a standard action sans AoO, regardless how much you move through the threatened creature's spaces. "Disengaging Flourish" works analogue to the previous feat and "Disengaging Shot's" mythic feat allows you to add a dirty trick sans AoO with your shot - neat! "False Opening" increases AC and makes foes falling for the AoO flat-footed. Okay, I guess. "Flick of the Wrist" is neat, allowing for sleight of hand to make drawing light weapons as free actions possible, potentially flat-footing foes. And yes, this one has a mythic tier-based per combat cap - interesting, if potentially problematic logic-wise. Why does the DC not increase for witnessing the trick/falling for it? "Two weapon feint's" mythic version allows you to use mythic power to reroll feints and sacrifice multiple primary hand attacks for multiple feints. The improved version of the feat allows you to sacrifice the highest BAB attacks to render the foe dex-bonus-less for longer durations, potentially even until your next turn - Okay, I guess, but VERY specific. In a lot of cases, I consider the trade-off not worth it here, though I like the idea behind the feat. 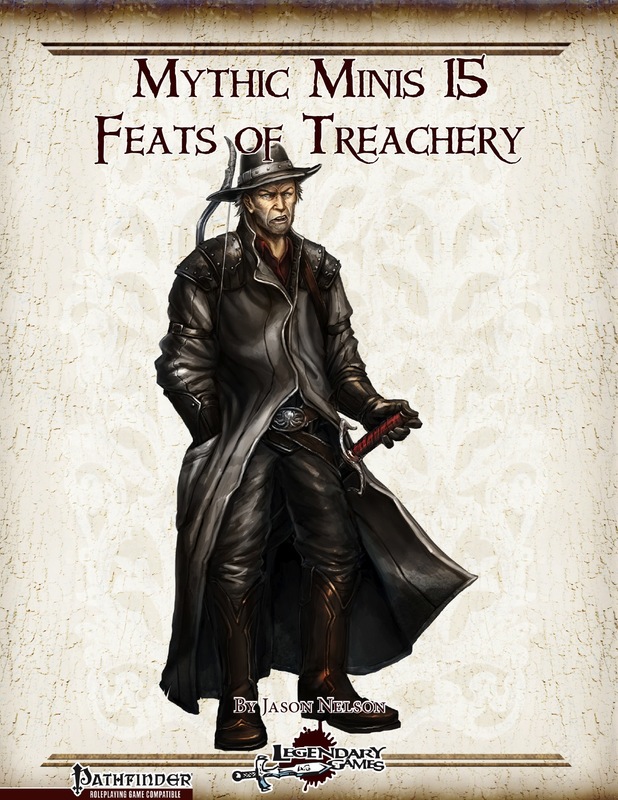 Jason Nelson provides a solid array of different treachery-based feats that allow for some nasty tricks...while some of the feats herein did underwhelm me. In the overall concept, none of the feats herein truly blew my mind and while they're not bad, I also wouldn't consider them must-purchase material. Hence, my final verdict will clock in at 3.5 stars, rounded up to 4 due to In dubio pro reo. Now available - come and get it! Reviewed first on Endzeitgeist.com, then submitted to Nerdtrek, GMS magazine and posted here, on OBS and d20pfsrd.com's shop.